With a few changes to your settings you can make your home wireless network more secure. Here we'll show you 5 of our most recommended tips. Most of these only take a minute or two to do. Using all, or a combination of them, you'll give your home network the best possible protection. Wireless encryption scrambles the signal of a wireless network, so it can only be read with the correct key (password). Over time, newer encryption standards have been introduced to improve security and combat the threat of hacking. As a rule of thumb, older encryption standards are more susceptible to attack. Since September 2008, all Plusnet routers are set up with WPA-PSK encryption and a strong password. This should be enough to prevent intruders gaining access to your network. Our routers also support WPA2-PSK. If your computers and devices are compatible with it, we recommend switching your network to this when you can. If you received your router before September 2008, from another ISP, or you bought it yourself, you should check the settings as you may be using WEP encryption. WEP does offer a modest level of protection, but known weaknesses make it fairly easy for a hacker to bypass. Even with the very best encryption, your network security is only as strong as the password it uses. Using a weak password could allow a hacker to gain access to your network within a few minutes. Since September 2008 Plusnet routers use a strong wireless password as standard which is unlikely to need changing. Even so, you should be aware that the password is printed on the bottom of your router and the setup sticker (if included). Changing router settings is as easy as using a web browser to access your router's internal setup page. Anyone who is connected to your network can do this if they know the IP address of your router and the router username and password. The default login details for most routers are basic and publically known, so it's a good idea to change the default password to something stronger. Plusnet routers are set up with a strong password that shouldn't need changing, but you should be aware that the password is printed on the bottom of your router and the setup sticker (if included). Please see How to change the password on our Thomson routers if you'd like to change your Plusnet router password. Choose something you'll be able to remember! See this Microsoft guide to strong password creation for more tips. 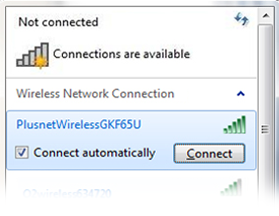 The Wireless network name (or SSID) is the name you look for when scanning for available networks. You should consider changing it to put a potential hacker off. This is because they'll see you've made some effort to secure your wireless network. While it seems obvious to call your network My Home Network, or something similar to identify it as your own, this can make it easy for a hacker to identify where your network is.